that offers the best in choice and service. Our Executive Chef is able to address guests’ various diets and food preferences. Our daily menu features 20-25 daily choices for lunch and dinner with daily specials. Our guests can choose from an elegant main dining room with al fresco dining and our informal Café at The Grand. Sunday Brunch is available on Sundays from 10:00 AM until 2:00 PM. 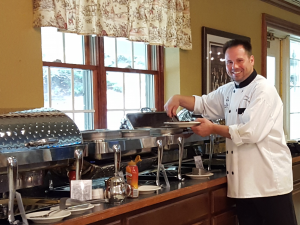 Brunch features include: an omelet station; a carving station with country ham; Belgian waffles; sausage/bacon; an assortment of fruit; cookies and sweet rolls; and at least four hot entrées that vary weekly. Reservations for Sunday Brunch are required and can be made by calling (412) 833-2500.